The latest disaster in the Philippines is another tragic reminder of the need for innovative power solutions both post and pre-freak weather emergencies. 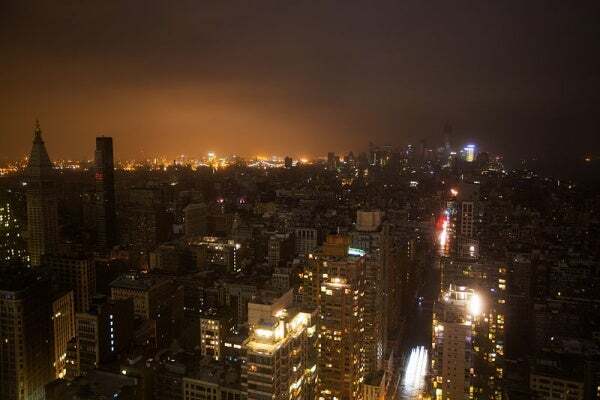 Citywide power outage caused in Manhattan by Hurricane Sandy. Image courtesey of Hybirdd. When natural disasters – such as Typhoon Yolanda (also known as Typhoon Haiyan) that exploded through the Philippines last Friday – hit, the most urgent need is for food, water, shelter and medical supplies. After these basic human survival essentials, restoring some kind of power is also a vital element to disaster response. It’s needed to keep over stretched hospitals running, provide light to restore order at night, provide warmth if needed and power for vital communications. As well as killing an estimated 10,000 people, displacing 673,000 and impacting, in all, around 11 million, Typhoon Yolanda has left the Philippines’ power grid badly damaged and out of action. The National Grid Corporation of the Philippines (NGCP) has reported to date 566 transmission towers and poles leaning or toppled and seven substations hit by Yolanda, leaving many of the on the islands with limited or no power. "Typhoon Yolanda has left the Philippines’ power grid badly damaged and out of action." After the devastation caused by Hurricane Sandy, which hit New York in 2012, a task force was partly created to find solutions for a smarter more flexible grid that would minimise power outages and fuel shortages in the event of similar emergency situations in the future. Such technology is not yet fully available, especially in third world countries, and while it may be a while off yet, the Hurricane Sandy task force’s report does highlight an interesting solution that is fairly easily applied. The report found that power outages in New York were minimised, to some extent, by existing microgrids and onsite, renewable energy sources. The team are now looking at up-scaling this kind of network of technology in preparation for future natural disasters and as part of their restoration work. Pirate Party, a political party with a platform of open intellectual property (IP), and the UN have teamed up to provide new disaster relief kits that include a Tesla Box, which is a ten foot shipping container, that provides power for a whole neighbourhood by harnessing the sub-atomic Casimir Effect. The containers also include wireless light bulbs, mobile device chargers, rechargeable desalination straws and an Internet-in-a-suitcase. "The report found that power outages in New York were minimised, to some extent, by existing microgrids." Nasa are also looking at alternative power supply for when the grid is ineffectual. It is currently working on a novel idea that captures solar energy in space through a network of intelligent mirrors and transports it back to Earth through a microwave beam. This idea, according to John Mankins, the former head of Advanced Concepts Studies at Nasa and now president of Artemis Innovation, is currently around 15 years off development if it incurs no major problems. It would be ideal for disaster relief because it can be used on an as-needed basis and power can be beamed to remote islands, like the Philippines, and other hard to reach disaster-struck locations. "From space, we can deliver power directly", Mankins told Fox Business news. There is a range of other less-fancy readily available portable power solutions available for power relief when devastation strikes, including: Sunlife’s modular solar power solutions, which enable customers to build their own personal solar energy solutions by choosing from a variety of solar panels, LED rechargeable lamps, a rechargeable battery pack, as well as mobile phone connectors and radio connector, and Firefly’s newest edition, a Cygnus Hybrid Power Generator, which can deliver single or three phase 415V, with integral transfer switching that moves between external and inverter power. "Nasa are also looking at alternative power supply for when the grid is ineffectual." However, as large scale natural disasters become more frequent – a clear indication global warming is taking its grip, some experts would say – it’s encouraging that scientists and officials, particularly in America, have acknowledged the need to not only have post-disaster solutions, but incorporate power grid resilience so that they can shut down and self heal, as well as provide smart back-up solutions in homes and businesses when needed. In the future, let’s hope, that maybe one day scientists may even find a way to plan and harvest energy from the very freak storms and typhoons that currently take it away. Germany is turning to virtual power plants (VPPs) to tackle the problem of intermittent renewable energy supply. Power-technology.com lists the 10 biggest geothermal power plant installations in the world based on net capacity.